Pat Lam, the former Connacht Rugby coach is the man who taught Connacht Rugby how to turn dreams into reality - the Pro 12 trophy is the most tangible evidence. Every coach wants to make that difference, to achieve success on the pitch. 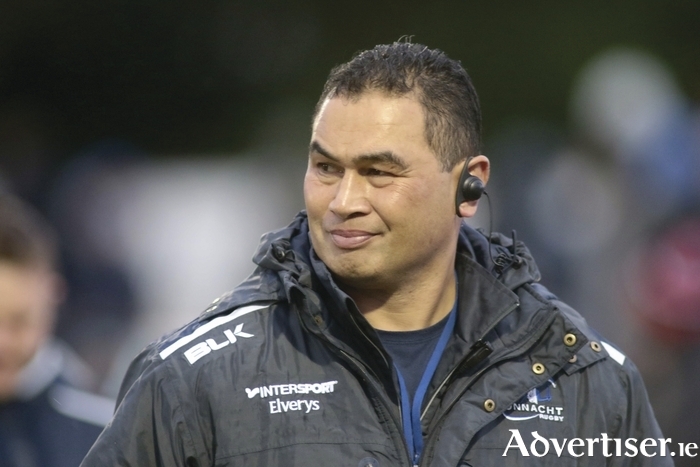 Lam has fulfilled that brief, and ultimately has left Connacht Rugby in a better place. Lam recalls the moment he received Connacht's call. Walking the streets of popular Auckland suburb Mt Eden late one night, just days after becoming officially unemployed, Lam and his wife Steph were wondering what next for the former Auckland and Blues coach. The couple decided to pray. Two minutes later the phone rang and it was Connacht with an offer on the table. "Steph jumped up and down, and said 'This is great"; I said 'Let's wait and see. '"He took a a couple of days to consider, watched The West's Awake, and read more about the province before telling Steph he "thought it was 'the one'"; Steph, however, said she knew. Connacht was not top of Lam's list of future clubs to coach, but then again, the New Zealander was not Connacht's first choice either, he says. Things, however, are sometimes meant to be. He liked Connacht's vision of becoming the best in five years, but on arrival he found the process of achieving that vision rather flawed. "It was a vision they made up because that is what they wanted, but they hadn't been through the process, no one knew that goal, and unless people have bought into it, it is a waste of time." The incoming coach was blessed when his predecessor Eric Elwood "laid it on the line" at Lam's first board meeting about Connacht's culture. "He let rip," says Lam. "He believed there was a strong culture in the team, but not as an organisation which was split. It's what I love about Eric, his passion for the place." Luckily, says Lam, it "hit home" with the board. "They had a vision, yet no one understood it; decisions were being made by management, the PBG and no one was following the same vision." With CEO Tom Sears leaving, Lam decided to concentrate on changing the culture of the team first. "You know change has to happen. I could see the passion when I spent the month watching Eric, so I knew I needed to grab hold of that and build on it. Ultimately the biggest change was the way we play." Lam, having been told Connacht were more akin to a bunch of "misfits", confesses he was rather surprised just how tough they were, and after year one, he abandoned his mental fitness test. "I couldn't break these guys. I knew they were tough, but I needed to channel it into the right areas - for example, on the field with players getting up more quickly to get into position. With all the best teams having both players and resources, the only way to compete was by bringing all the resources together and playing as a team. It involves 15 guys being absolutely skilled as individuals, but there are also team skills that everyone has to do. "It doesn't matter the competition you are in, but what does matter is what you do day to day, so if we train, prepare, and all our standards as management and as players are international standards, then when we get to a game, no matter who it is against, we think, this is OK, we can handle it. It is forgetting about the outcome, but ensuring everyone is clear on the vision, their role, how to play. We are determined by what we do day to day, and everyone has to drive it." Allied to the way Connacht began to play was Lam's decision to embrace the entire province - Sligo, Leitrim, Roscommon, Mayo, and Galway. A map of Connacht at the Sportsground was the inspiration for the now famous handshake, developed by three players, and voted on by the squad. "I knew who we represented and heard talk of a perception that Connacht was a Galway team, but I wanted to make sure that was not the case," he says. A ticket to the All-Ireland final involving Mayo gave him another great insight into the inter-country rivalry, visits with the family to far flung areas of the province helped, and taking the squad out of Galway for training sessions reinforced to both players and supporters of the Connacht family. "I knew the boys wanted to get better, but you have window of opportunity to show them what you can do and what they can do," says Lam. "If you don't, then very quickly the boys will go 'Hmm, not sure out this', so I know at some stage we had to get success." That turning point came away to Toulouse - Connacht's biggest win over the big budget aristocrats of Europe. A year later he completed the remarkable rags-to-riches story when defeating Leinster at Murrayfield to claim the Guinness Pro 12 trophy. They did so with a swashbuckling brand of rugby, played at pace and with confidence. This structured approach showed how players such as Matt Healy and Niyi Adolokun could develop and thrive - youngsters who had been playing club rugby until his arrival. Giving youth a chance, he continued to develop players for Ireland - Finlay Bealham, Ultan Dillane, Kieran Marmion, Tiernan O'Halloran, Jake Heenan, and Jack Carty. Twinned with that development was instilling a change in mindset. In challenging players "to stop looking over their shoulder " at Munster and Leinster, they began to understand and believe in what were doing, that they could beat anybody. "I had a clear goal that I wanted people to play for Ireland and one of the highlights of my time here is that 12 guys have been capped for Ireland, which is phenomenal - six are going on tour this year, seven last year, and five in the Six Nations," he says. Winning the Pro 12 trophy - the only Irish province to have won a trophy in the last three years - is of course right up there. "When we won in Northampton it came after years of underachieving - it was expected," says Lam. "The same with Newcastle and Auckland, but to do it with Connacht really signified how much a team effort it was. Yes, I was front and centre with John Muldoon and the other leaders, but it took everyone - not just Connacht Rugby, but the community, and I will never ever forget those scenes. I feel privileged. I don't think I will ever be part of something like that again because of the effort to make it happen. "I would like to think the legacy is the mindset, that we an do anything. Chase your dreams. There are always people in life who will knock you, but if you believe, and there are people who will believe in you, then you can achieve." The downside to winning the Pro 12 is now the expectation, but resources remain an issue. Lam has been able to sign some 13 players for Bristol in four weeks, but Connacht remains hamstrung. "That is always going to be a difficulty here and that is why Connacht needs a new stadium to boost resources," he says. Lam, who had also played for Newcastle and Northampton, describes his life as a journey. He and his family left Galway this week for a holiday in Italy before their move to Bristol - son Bryce, who is studying at NUIG, remains in Galway. While sad to leave, he says he does so with peace of mind. "You get peace of mind and satisfaction from knowing you did the best you could. It doesn't matter what sport. It is about bringing people together. It's not about trophies or winning, but culture, teamwork, relationships, development as individuals, surviving tough times, and when I look back I feel able to say it was true success for me. "Coming to Ireland was just special. We have made life-long friends, not just from rugby, but the community. I can guarantee I will be back."